Located on a once desolate moor in Pentland Hills, south of Edinburgh in Scotland, ‘Stonypath’ is both a conceptual work of art and widely recognised as one of Europe’s greatest modern gardens. 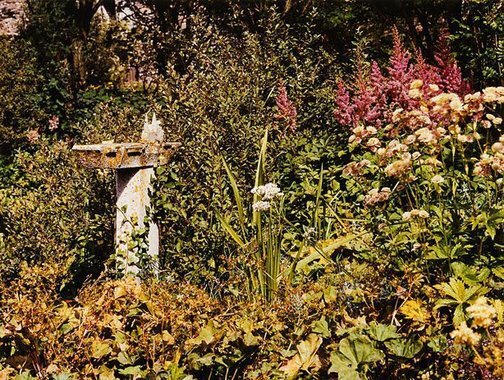 In 1966 when Scottish artist Ian Hamilton Finlay and wife Sue moved to the property they began a process of transformation by making ponds and planting trees and other flora. From time to time Finlay created artworks collaboratively with stone masons, engravers and others which were set among the landscaped grounds. This series of photographs by David Paterson reveals some of the 275 individual artworks at ‘Stonypath’ including neoclassical statues, architectural fragments, sundials, temples and stone plaques, many engraved with English and Latin words or phrases. Highly regarded as a concrete poet (in which the visual appearance and combination of words is as important as their content and effect), the creation of ‘Stonypath’ enabled Finlay to work physically with the form of words, a process sometimes referred to as environmental poetry. Finlay chose names, phrases and titles that drew from themes which have dominated his work, including the French Revolution, the classical world, war, fishing boats, landscape and philosophy. Despite his serious intent, some of the expressions are humorous (a tablet inscribed with ‘Bring Back the Birch’ placed next to maple trees). Other artworks are deferential including the French painter Claude Lorrain’s signature engraved on the side of a bridge which crosses over a picturesque pond.